The Small World is a non-profit charitable organisation registered in Nepal that supports locally driven sustainable community development projects with a special focus on breaking the cycle of poverty and an emphasis on education and empowerment for women, children, and young girls who are at risk for exploitation. We would like to announce that The Small World is now partnering with Australian photographer Rochelle Hansen to create a life changing photographic tour of remote Nepal. Join us as we follow in the footsteps of Sir Edmund Hillary and Tenzing Norgay as we make our way through the breathtaking villages in the Himalayan mountains. Immerse yourself in the traditional lifestyle of the Nepalese people, experiencing their rich culture and warm personalities. Photograph the projects developed by The Small World and witness the positive effects the organisation has on the communities. Along the way we will be trekking through Taksindu, widely known as the Sherpa climbing community and home of world renowned climber Babu Chiri Sherpa who has set two world records on Everest. Share tea with monks in a monastery nestled amongst the beautiful soaring mountains, and be welcomed in the homes of local villagers. Take in the breathtaking sights through the eye of the lens and join us on a once in a lifetime photographic tour of remote Nepal. Day 01: Welcome to Kathmandu! Welcome dinner/introduction to project begins at 5pm. Included: Dinner, Accommodation: Hotel- Tibetan Peace Inn or equivalent. Day 02: World heritage cultural tours around Kathmandu including Bouddhanath (Stupa) and Swayambhunath Temple. Extra activities include visiting an evening Puja ceremony at a special Nunnery Monastery where we will also share tea with them. In the evening, there will be a talk about the challenges you might face, protocols when photographing people and an insight in what you can expect whilst in the remote region. You are free to ask any questions and will be asked to think about what you want to achieve whilst on the trip. Included: Lunch/transport for the day. Accommodation: Hotel- Tibetan Peace Inn or equivalent. Day 3: Orientation and visit The Small World project in Kathmandu. Lunch provided before heading back to Thamel for a short tour. You will then have the evening to explore. Included: Lunch at Kathmandu project, transport. Accommodation: Hotel- Tibetan Peace Inn or equivalent. 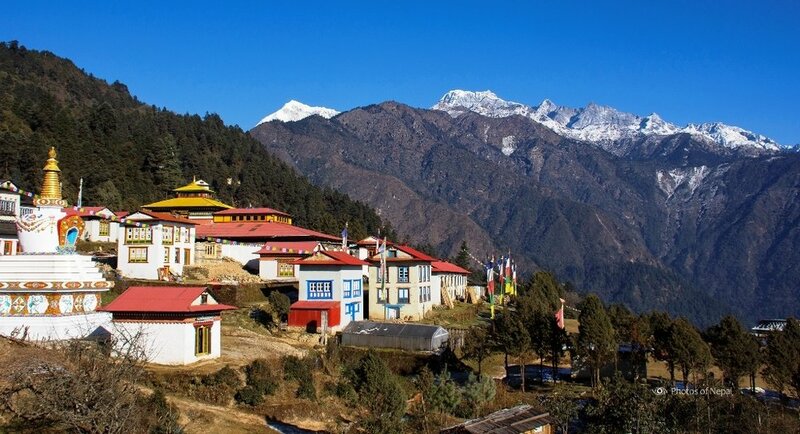 Day 4: Travel to Solukhumbu in morning by plane (approx 1 hour). Stay the night at the Girls’ hostel where 40 girls are on a full scholarship for higher education provided by The Small World. We will be meeting the girls and experiencing a welcoming cultural dance and a short language lesson. After dinner, part-take in a photography workshop, then upload and edit your photographs. Included: Breakfast, lunch and dinner. Accommodation: Girls’ Hostel. Day 5: During the morning we will visit the White Hills and Jana Jgriti schools where the girls are studying. We will be able to spend time with the children, visiting classrooms, seeing the way they teach. They love seeing their pictures captured in the camera! After lunch, we will visit the people of the Dalit community, which is a traditional cast in Nepal. We will see their work, how their families live, their customs and culture, all whilst taking in the beautiful landscape. Upload and edit your photographs. Included: Breakfast, lunch and dinner. Accommodation: Girls’ Hostel. 6:Trek (3hr) to Chiwang Monastery. “once we arrive at the monastery we will enjoy a cup of tea with the lama, getting to know him and hearing about his life.”We will have the opportunity for a photo session of their cultural activities, including a Puja Ceremony. During the evening you will have the opportunity to upload and edit photos before we have a group session sharing our work in progress. Included: Breakfast, lunch and dinner. Accommodation: Monastery. Day 7: Trek (3-3.5hr) to Takisndu pass for a beautiful mountain view. We will have the opportunity to photograph the sun set and sun rise on the Himalaya mountains. You will get the chance to have a one-on-one review session with Rochelle. Included: Breakfast, lunch and dinner. Accommodation: Guest House. Day 8: Trek (3-4hr) to Phuleli. Over night staying at a family home to experience the local culture. Explore local villages and visit a local school. Upload and edit photographs. Included: Breakfast, lunch and dinner. Accommodation: Homestay. Day 9: Work with local community or visit the building site of the community health center and community centre. Join locals working in the fields, documenting their daily lives. You will have the opportunity to upload and edit your photos before we have a review session in the evening. Included: Breakfast, lunch and dinner. Accommodation: Homestay. Day 10: Trek to Taksindu(4hr), a very beautiful monastery in the mountains. Upload and edit photographs. Included: Breakfast, lunch and dinner. Accommodation: Monastery. Day 11: Trek (4-5hr) to Phaplu/,a beautiful Sherpa village along the lower section of the Everest Base Camp trek. We will stay overnight at a Trekkers’ lodge. Visit the local hospital. Upload and edit photographs. Included: Breakfast, lunch and dinner. Accommodation: Trekkers Lodge. Day 12: Drive back to Kathmandu by private jeep through the diverse Nepali landscape- through high mountain passes of up to 3500m, and experiencing the Terai flat, low land. Stop along the way for lunch. Free evening to explore and try local restaurants. Included: Breakfast, lunch. Accommodation: Hotel- Tibetan Peace Inn or equivalent. Day 13: Free day to relax in Kathmandu, followed by a Goodbye dinner. A projector is available, so everyone will be invited to submit a selection of their photos to be presented before dinner. Rochelle will be available in the morning to help with final selections, celebrating the wonderful work everyone has done and the amazing experience we have all shared together! Included: Breakfast, dinner.Accommodation: Hotel- Tibetan Peace Inn or equivalent. Day 14. Tour ends after breakfast. The Small World will arrange airport transfers. Included: Breakfast. All levels of photographers welcome! Accommodation in Kathmandu with bed and breakfast. Additional meals where specified. All private transportation including airport pick up/drop off provided by The Small World. Tours in Kathmandu with local expert guide and private transportation. Domestic flight Kathmandu to Phaplu. Private jeep return to Kathmandu. 3 daily meals during the trek (breakfast, lunch and dinner with tea , coffee and juice) from Kathmandu to Kathmandu. Chef and local guide arranging all details; including dietary requirements and hygiene. All Nepali staffs’ wages and insurance. Porters for all members’ baggage during the trek from Phaplu to Phaplu. Rochelle Hansen as a photographic guide. One-on-one feedback/photography guidance from Rochelle Hansen. Extra food not stated in program. Personal items, including a sleeping bag. Trekking in remote areas, although beautiful, can be strenuous. Please ensure that you have asuitable level of fitness. Moderate grade trekking. Homestays in remote regions is an experience you will never forget; however, there are limited facilities. Outdoor toilets and going without a shower, is all part of the experience. You will interact with the Dalit community and their traditions. This is a fantastic opportunity to immerse yourself in the local way of life- so keep an open mind and be respectful of cultural differences. The going can be slow over long distances. Our jeep ride back to Kathmandu will be bumpy but a little bit of patience will go a long way towards enjoying the beautiful landscape. • Porters will carry your luggage but you will be responsible for carrying your own camera gear and laptop. Rochelle Hansen is a graduate from Photography Studies College Melbourne. She has worked as a freelance photographer for the past 2 years and has travelled to Nepal and India to work with charities, both photographing them and teaching English. Recently she was selected to be one of 10 international artists to go to Iceland for a 2 month art residency. 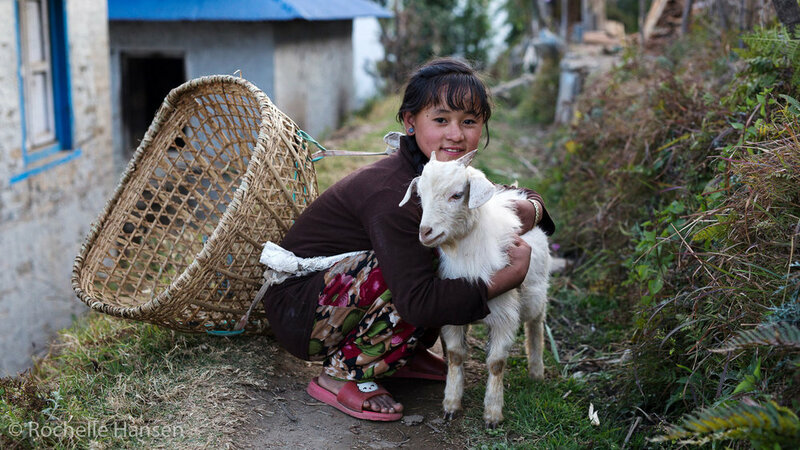 Rochelle travelled to the Solukhumbu region on assignment for The Small World Organisation in 2017 to photograph the work they have been doing in the remote communities. She trekked for 10 days visiting the schools and houses that have been rebuilt since the Earthquake.